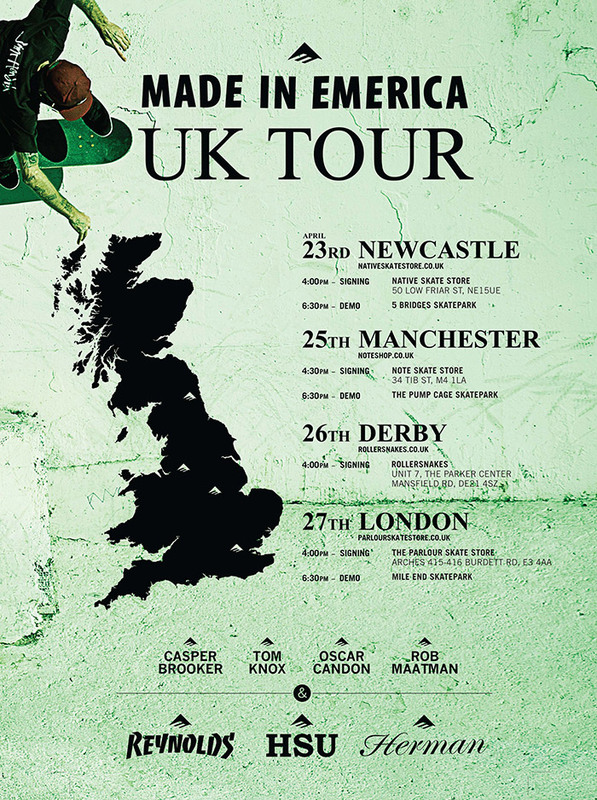 Emerica’s skate team head to the UK this month to hit the parks and sign some stuff. The Emerica team are sick and it includes some of the all time greats such as Jerry Hsu and Andrew Reynolds. With only 4 cities on their map and only 1 skate spot per city, this is going to be a bit of a whistle stop tour. Fortunately, the team will be doing a signing before each demo, so you will get a chance to meet them before they leave your city. For us Londoners, it’s all going down at London’s favourite skatepark in Mile End, with the on-park shop Parlour hosting the signing. Fingers crossed the weather holds out like it did for the recent Smash & Grab competition. Personally, we can’t wait to see these guys rip some of the UK’s best parks! *UPDATE: Watch the tour video here.